You are here: Home / You Belong to a Community of Kindness. You Belong to a Community of Kindness. Your donation changes lives. It’s that simple. Amara and her two young daughters relocated to Northern Virginia last year. While Amara grew up in New England, she and her mother came to America when she was just seven to escape violence and poverty in east Africa. In New England, Amara had a job, but hoped to go back to college and train for a career in healthcare. After her marriage ended, and knowing there were more opportunities in Northern Virginia, Amara and her daughters moved in with family who live in the area. Although Amara was working within two weeks, commuting to her new job was difficult without a car, even with public transportation. The cost of living was higher than expected and childcare costs took nearly half of her income, and made it hard to get ahead. While Amara was determined to make it on her own, as time passed, she knew she needed a hand to help bridge the gap to self-sufficiency. Amara found that help in Cornerstones’ Laurel Learning Center. 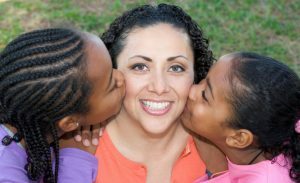 Not only did she qualify for tuition assistance based on her income, she saw her daughters thriving in the care of their teachers, and making new friends. The staff at Laurel helped connect her to additional Cornerstones resources, and Amara and her family now have their own place to live and the resources they need to thrive. While she is already a qualified medical assistant, Amara has been able to go back to school to pursue a nursing degree to expand her opportunities in the medical field. Amara believes working hard and going to school full time provides a good example for her girls. Amara and her family now have a feeling of belonging—and of hope—and look forward to “paying it forward” as productive members of our compassionate community. Our community is founded on the very principle that when everyone has a chance to secure housing, find meaningful work and see their children grow and thrive, the whole community becomes stronger. Your support helps people in need build the connections that make families, and our community, so strong. With your gift, our neighbors in crisis will be empowered to achieve their dreams of self-sufficiency and find the connections and place where they belong.